Writers of Southern Nevada | An organization of authors and wordsmiths focused on advancing the craft and business of writing through education, collaboration, networking and shared resources. 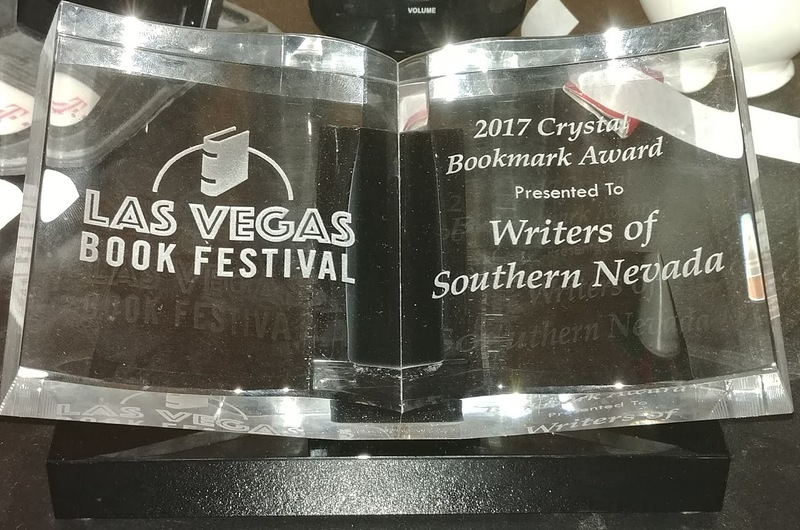 awarded WSN the Crystal Bookmark Award for community service in 2017! and cliffhangers in all types of writing. Moderated by WSN Member Suzanne Munshower. Also, for anyone looking to get more involved, boost their writing resume by joining the board, or simply share any programming ideas, arrive an hour early (at 5:30PM) to sit in on our open Board Meeting! can help you reach your writing goasl! Saturday, March 23, 2019 AUTHOR SHOWCASE – presented by Henderson Public Libraries. Tuesday, March 12 12, 2019 Writer’s Roundtable discussion group - “The Soil Beneath the Soil: Adding the Nuances of Place Into Your Story” Moderated by Greg Blake Miller. Tuesday, February 12, 2019 Writer’s Roundtable discussion group - “What’s Love Got to Do With It: Writing About Relationships, Minus the Mush.” Moderated by Greg Blake Miller. Tuesday, January 8, 2019 Writer’s Roundtable discussion group – “Social Media And You” - the pitfalls and challenges (and rabbit holes!) moderated by Diane Taylor and Morgan St. James. Tuesday, December 11, 2018 from 6:30-7:30PM Writer’s Roundtable discussion group - “Heating Up During The Holi-daze” – goal setting for the new year moderated by Eric James Miller. Tuesday, November 13, 2018 from 6:30-7:30PM Writer’s Roundtable discussion group - “Common Myths About Writing” moderated by Ned Barnett. Saturday, November 3, 2018 from 2-4PM PAINTED STORIES – CHILLS words turned into pictures with local authors Tonya Todd, Larry Johns, Oksana Marafioti and artist Meegan Boiros at Joe Maxx Coffee House. Tuesday, October 9, 2018 Writers Roundtable discussion group – “The Art of the Scary Story” moderated by Greg Blake Miller. Tuesday, August 14, 2018 - Writer’s Roundtable discussion group – Coffee Press, Paseo Verde Library. August’s topic: “TIPS FOR USING RESEARCH TO ADD AUTHENTICITY TO YOUR WRITING” moderated by Eric James Miller. Tuesday, July 10, 2018 - Writer’s Roundtable discussion group – Coffee Press, Paseo Verde Library in Green Valley Ranch. This month’s was topic: “The Art of the Twist – Dropping Clues In All Genres” moderated by Morgan St. James. Tuesday, June 12, 2018 - Writer’s Roundtable discussion group – Coffee Press, Paseo Verde Library in Green Valley Ranch. This month’s was topic: “The Use of Wit and Humor In Serious Writing” – What does the lighter touch do for the author and the reader? Bring your favorite examples, or examples of your own work to read and discuss. This was a very lively and thought-provoking subject for those of us who earn extra income by writing for blogs, magazines or other non-fiction markets! Moderated by local journalist and humorist Diane Taylor. Thursday, May 17, 2018 WSN presented a panel discussion to the Las Vegas Writers Group with true crime author Morgan St James and professional private investigator and author Vito Collucci on: “Ripped From The Headlines – Using Real Life Events in Your Writing” at The Tap House on Charleston. OPEN CALL for short stories or excerpts from longer works (~2500 words) for our 2018 lineup of Painted Stories (themes: love, romance, adventure, travel, paranormal, spooky, sci-fi, mysteries, historical or autobiography). Send to nevadawriters (at) gmail (dot) com with the Subject: Painted Stories submission. ARTISTS WANTED! Want to make an easy $100? Become one of our Painted Stories artists! Click here for more info. be sure to visit and ‘LIKE’ our Facebook page. to focus more eyeballs on you! Interested in becoming a WSN Member?